Recently Ancestry.com put up a new set of records called “Historic Pennsylvania Church and Town Records.” The collection contains a wide variety of miscellaneous records from the Historical Society of Pennsylvania. I actually found a few items of interest in the collection. One subset of records comes from the Wackerman Funeral Home, a funeral home which still exists today but is no longer in its former location. In these records, I found information on the funeral arrangements for my great-grandmother, Marie Bergmeister, who died in 1919 at the age of 43. Marie (or more usually, Maria) left behind a husband, Joseph, and five children – including my grandmother Margaret, the youngest, who was not quite six years old. 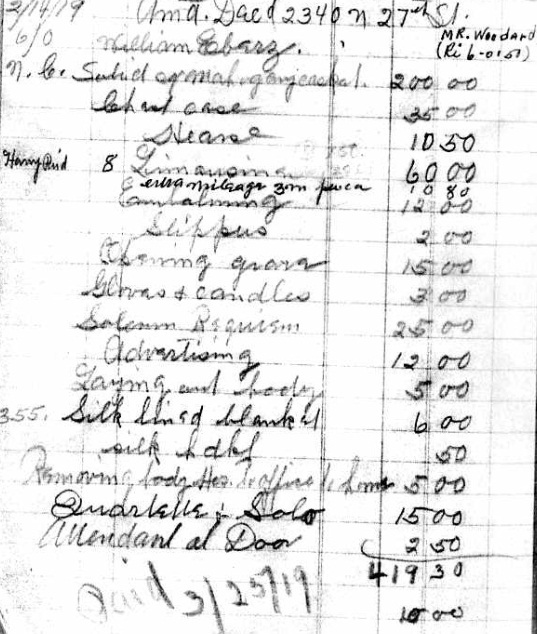 The funeral home record for the costs of Marie Bergmeister's funeral, 1919. 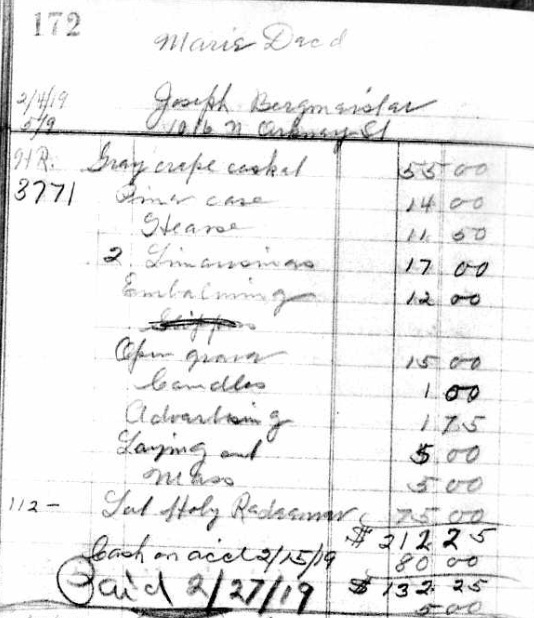 I knew that my grandmother’s family was poor, but it was interesting to compare the bill for my great-grandmother’s burial to some of the others who died at the same time. A more costly funeral found in the same records. Update 2/8/2011 – see the follow-up to this post for more info! Sometimes waiting to receive copies of records is worth the wait. But sometimes it’s not. Such was my adventure with USCIS, the U.S. Citizenship and Immigration Services. As I wrote in The Waiting Game in September, I requested a copy of my great-grandfather’s naturalization info. I did this despite the fact that I already knew his naturalization date and had a copy of the papers. But I was curious if there was anything else in the “file”. I had two goals in mind. First, I wanted to see if there was a photograph. Many naturalization records contain photos, but my great-grandfather’s did not. Did I have the complete package? Since I only have one photo of him, it was worth finding out. Next, I had a mysterious addendum to his naturalization that I received from another agency – would the USCIS file contain it? Let me start at the beginning. Early on in my research, circa 1989-91, I found the naturalization papers for my great-grandfather, Louis Pater, at the Philadelphia City Archives. He was naturalized in 1925 at the local level in the Philadelphia Quarter Sessions Court. These local naturalizations were not available at the National Archives (and still aren’t, nor are they available online). The City Archives had a file of index cards, and the archives’ personnel would photocopy the Declaration of Intent and the Petition for Naturalization for any name you found. For reasons I can’t quite recall, in late 1992 I submitted a FOIA (Freedom of Information Act) request to the Department of Justice, where the naturalization information was then held. Perhaps I was looking for that elusive photo. I didn’t get a photo then, either, but I got the previously received declaration and petition. The difference was that this time, the birth dates of Louis’ children listed on the petition were blocked out for “privacy” concerns as the data was considered “personal”. In addition to these two documents, they sent me a comical series of papers that was supposed to be Louis’ passenger arrival record…only every line on the manifest was blocked out. This included his sister and brother-in-law’s lines above his. If you are familiar with passenger arrival records, you know that if a family is traveling together, the persons listed underneath the first person usually get ditto marks for the repeated info. Without the first family member, Louis’ passenger arrival record was a bunch of ditto marks. I should point out that in 1992 when I received this, all five of his “children” were deceased anywhere from 20 to 50 years. In fact, some of their birth dates were publicly available in the Social Security Death Index, one of the few sources of online information back then. And, even though the Ellis Island web site was not yet operational (nor was Ancestry), the passenger list was fully available via the National Archives. But I digress… The DoJ file contained one additional piece of information – a barely legible typewritten letter from 1940. It seemed to indicate that my great-grandfather committed a crime and was sentenced to two to four years in prison. I can’t quite read the entire letter, but it was apparently meant to let the naturalization service know that they may have give citizenship to an unsavory character. I assume that if he had committed further crimes, they would have deported him. It was my inability to read this letter that led me to try the USCIS search. After all, they talk about receiving a “file” so I didn’t know what other information might be included. First I paid for an index search, which was unfortunate since it turned out that the “index number” was his naturalization number, which I already had. But they don’t really tell you that and make it seem that the index search must precede the file search. The index number cost $20 and took five months to receive. Once I received the number, I submitted a Record Copy Request for $20. Two months later, I received the “file”. I received the Declaration of Intent, the Petition for Naturalization (shrunk to 8.5” x 11” or half the size of the original document), and his certificate. The children’s birthdays were also blacked out on the Petition. I had also received the certificate from the DoJ, but this copy was easier to read. No photo. No mysterious letter about his arrest. With the above, I also received an amusing letter explaining that they “completed the review of all documents and have identified 3 pages that are We have reviewed and have determined to release all information except those portions that are exempt.” I’m an employee of the U.S. Government, too, and we actually use spell-check and grammar-check. The letter goes on to say that “certain pages contain marks that appear to be blacked-out information. The black marks were made prior to our receipt of the file.” Which makes me wonder…where did they get the files from? And where are the originals? Apparently, the City Archives has unmarked copies, but the federal agencies do not. Do the originals exist? If the new USCIS agency (part of the Department of Homeland Security) does not have the file that the Department of Justice had, where did those files go? I end my quest seven months later and $40 short. My great-grandfather didn’t need a photo for his naturalization, and I received no additional information. Are you looking for your ancestor’s naturalization? If I were you, I’d stick to either online resources like Ancestry or Footnote. Or, it pays to find out if there are naturalizations at the local level. In my case, 2 of my 3 great-grandfathers were naturalized in the Philadelphia Quarter Sessions Court. These records are kept at the City Archives. There is an index, but it is not online. In fact, it’s not even computerized on site – at least not twenty years ago when I was there. It pays to review the courts used in your area and looking at the federal courts that have been indexed. USCIS may still be worth it to some researchers, however, because in addition to naturalization records they also hold alien registration files and visas. Even if your ancestor was not naturalized, alien immigrants were required to register with the Government in the early 1940’s. I still may pursue this for some of my non-naturalized relatives. As for my hard-to-read letter detailing the alleged incarceration of my great-grandfather, I never would have known about it if I hadn’t tried the FOIA request years ago. But where those files are now is anyone’s guess. Since scanning has improved in the last two decades, I will try to scan the photocopy and see if I can sharpen the faded text to uncover the next part of this mystery. I’ve long admired DearMYRTLE and Ask Olive Tree Genealogy for answering so many questions from their readers. But I’ve been a little jealous too, because I wished that *I* had some questions to answer. Today I received a question via a comment to an earlier post, so I’ve decided to play the “Dear Abby” role perfected by Myrt (aka Pat) and Lorine and answer the question as a new blog post (especially since I’ve been quite slack in new blog posts lately)! In two previous posts, I discussed finding Philadelphia Marriage Records: Philadelphia Marriage Indexes Online looked at the Family Search Labs site with the indexes from Philadelphia marriages from 1885 to 1951. Then, When You Can’t Find Grandpa’s Marriage Record explored alternative marriage locations around the Philadelphia area if your ancestors lived here but the record is nowhere to be found in the above mentioned index. But today a reader asked a very good question that I hadn’t fully addressed in either post: what about pre-1885 marriage records? What was the case with Philadelphia marriages prior to 1885? Were marriage certificate required at any point? I’m trying to find out more on my 2nd great grandparents and was wondering if I should be trying to hunt down their marriage certificate (they married in 1884). The marriage records give the date of marriage, names, ages, races, generic places of residence and birth for both the bride and groom, minister’s name and address, and denomination of marriage performed. Most of the indexes are arranged alphabetically by first letters of last and first names, and then by year. If one of the parties to the marriage was Thomas Green and the marriage occurred on 31 August 1873, then one would look at the “G” volume, open to the section which included all people whose first names began with the letter “T” and then look at 1873. There are no separate indexes for men and women – all names are filed in the same index. Most of the indexes of this type stop between 1877 and 1880 so one would then have to look at the yearly indexes for the years 1877 – 1885. The Philadelphia City Archives is located at 3101 Market Street, Philadelphia, PA 19104. They can be reached by phone at 215-685-9400 (messages only) or 215-685-9401 (receptionist). If you do not live in Philadelphia or are unable to visit the archives in person, they will search the records for you. Send a written request with as much information as possible. If you know the exact date of the marriage, the fee is $10. If the exact date is unknown, a search will be made for $10 per each 3-month period searched (includes the certificate cost). Note that these fees are current as of today per the Archives’ FAQ page at http://www.phila.gov/Records/Archives/FAQ.html. Brad, as you can see, the time period for your 2nd great-grandparents is covered with existing records. If you can’t come to Philadelphia to perform a search yourself, the fee to search the entire year is a bit steep at $40 – so you may want to seek alternative means for look-up such as a local researcher. Another option is to subscribe to a genealogy mailing list specific to Philadelphia such as Philly-Roots hosted by Rootsweb/Ancestry. Often someone will ask other listers for help and you can make arrangements offline at less than the archives’ cost. That might help Brad, but the question remains for others with roots that are deeper into Philadelphia’s history than either Brad’s family or my own: What about earlier records before July 1, 1860? Church Records – Try using city directories and old maps to determine possible churches. If your ancestors were Catholic and you are lookingfor a record prior to 1920, one useful resource is the Philadelphia Archdiocesan Historical Research Center, which is located on the grounds of St. Charles Borromeo Seminary at 100 E. Wynnewood Ave in Wynnewood, PA. Contact them at 610-667-2125 for more information and fees for research. Newspaper Announcements – Very few old newspapers have been indexed. Genealogy Bank has some Philadelphia papers from 1719 through 1922. Marriage Registers exist for some years, but they can be difficult to find for the pre-1860 era. Try the Historical Society of Pennsylvania or search through the FHL catalog. I hope this has been helpful to other Philadelphia researchers. If anyone else has any research questions, I’ll try my best to help so please don’t be shy about asking! In the port cities on the east coast of the United States in the late 19th and early 20th century, many charitable organizations aided immigrants arriving from Europe. The Hebrew Immigrant Aid Society (HIAS) was one of those organizations. There were “ethnic” or “immigrant” banks in many port cities, usually conveniently located in the Jewish neighborhoods where newly-arrived immigrants tended to settle. These banks were commercial enterprises, started mainly by established German Jews, as a place where recent immigrants could save money and arrange to purchase steamship tickets to bring their families to the United States. 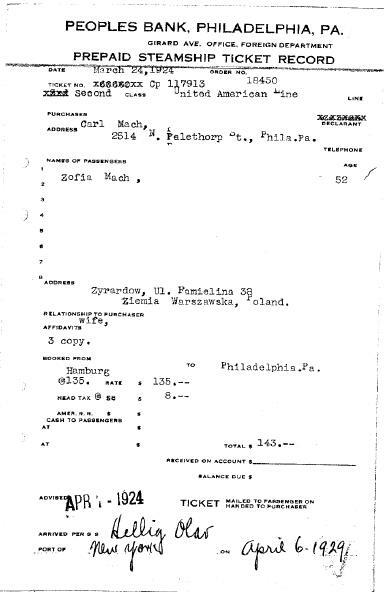 HIAS preserved the original records of some immigrant banks formerly operating in Philadelphia, Pennsylvania: Blitzstein, Rosenbaum and Lipshutz/Peoples Banks. Today, the record books of the Blitzstein Bank, Rosenbaum Bank, and Lipshutz Bank are housed at the Philadelphia Jewish Archives Center (PJAC). They offer unique kinds of information, including the name and U.S. address of the person who paid for the tickets, port of entry – usually, but not always the port of Philadelphia – and intended final destination (again, not necessarily Philadelphia). Two other interesting tidbits came from this record. First, it lists Sophia’s address in Żyrardów, Poland. Although I could not find it on a modern map of the town, the information could still come in handy for research in Poland. Second, it’s the first time I’ve seen the cost of a ticket to America on any of the records I’ve found. A second class ticket cost $143. In the 1920’s, that was a significant sum of money – note that her husband had this bank account for five years before she made the journey. The records of the three Philadelphia banks are also available on microfilm through the LDS Family History Library., and you can search the records via the JewishGen site if you do not have access to Ancestry.com. See the detailed pages at JewishGen on their US databases page under Pennsylvania. Be aware that the family I researched was not Jewish! One did not have to be Jewish to have an account at these banks. In total there are approximately 138,000 records among the three banks ranging from 1890 through 1949. If you had relatives living in or near Philadelphia, it may be worth a quick search – especially if you have had difficulty locating their passenger arrival record. Although the sites indicate that the records are held by the Philadelphia Jewish Archives Center, they wrote in their response that they are moving to the Temple University-Urban Archives Center “in late Spring”. So if you are planning to request a record, you may want to call either archive first prior to writing. One of my more popular posts has been Philadelphia Marriage Indexes Online. As that post indicates, the FamilySearch site’s collection of Philadelphia Marriage Records is great online tool for searching for marriage information. The collection is a listing of marriage licenses issued in Philadelphia from 1885-1951. While these records are technically an “index” they are not searchable – to find a particular person, you must browse through the records. This is easy for the years 1885 to 1938 because the list is alphabetical. For the remaining years, the last names were entered in the order of application, so it takes some manual searching to find a particular person. In my previous post, I lauded the availability of these records – not only can we search online, but they are free! But I’ve also come across some comments on mailing lists and message boards from some disappointed individuals who were unable to find their ancestors’ marriage records in this index. When you know a couple lived in the city, and you have an approximation of when they married, why can’t they be found in the index of Philadelphia marriage license records? Simply put, many Philadelphia residents went elsewhere to get married. This occurred mostly due to marriage laws that differed from state to state. These laws that govern how marriages may be entered into and officiated are at the state level, not federal, so the rules vary. For this reason, some couples married out of state, or at least outside of the borders of the city of Philadelphia. The Pennsylvania rules that they may have been circumventing usually involved age or the waiting period. In the commonwealth of Pennsylvania, a law was passed on October 1, 1885 that required marriage licenses to be obtained prior to a couple marrying. The county clerk of the orphans’ court was required to keep the records. At this time, the information required by the couple was rather simple and included the names of the couple, birth dates and places of birth, occupations and current residences, any previous marriage(s), and if the parties are related or not. Some of the interrogatories will be embarrassing in special cases, but the law is inexorable and they must be answered. The clerk of the court will be liable to fine if he fails to enforce the law to the letter, and parties answering falsely will be subject to the penalty of perjury. One of the requirements of this new law made the marriageable age 21. For anyone under 21, the consent of the parents was required. Suddenly, an out-of-state marriage market was born! By 1891, Camden was called “the Gretna Green of the Union”. Gretna Green was a small town in Scotland known for runaway weddings. A New York Times’ article explains that those “unable or unwilling to procure a license” in Philadelphia simply traveled to Camden for a quick and quiet marriage. The statistics cited in the article show that only 634 marriages were performed in Camden in 1885, the year that Pennsylvania changed their law. By 1890, the entire state of New Jersey had 15,564 marriages with one-third performed in Camden – “although the population of that city is less than one-fifteenth of the population of the State. My great-grandparents were Philadelphia residents who contributed to the booming marriage trade in Camden. 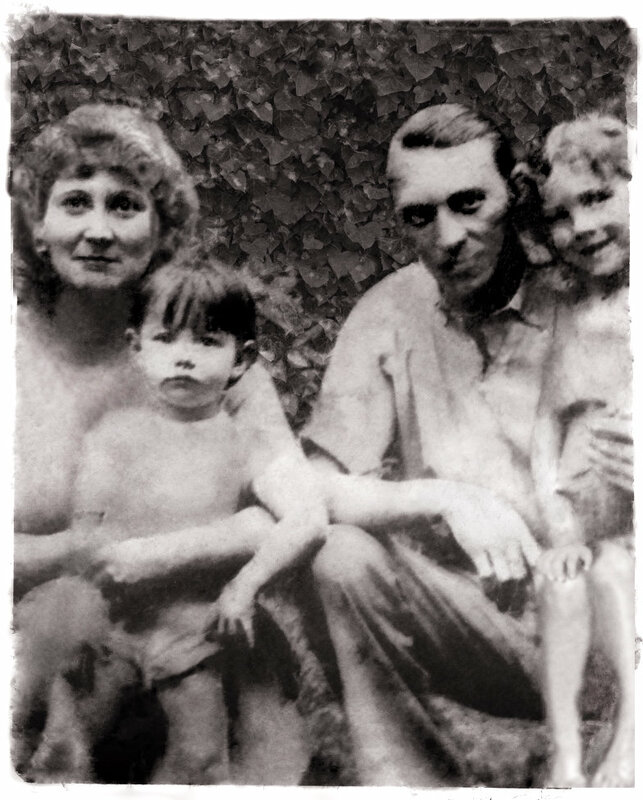 In 1910, Louis Pater celebrated his 17th birthday on August 24th. Three days later, he married Elizabeth Miller. On the marriage certificate, Louis’ age is listed as 22. Elizabeth is listed as 20 although she would only turn 19 in another three months. 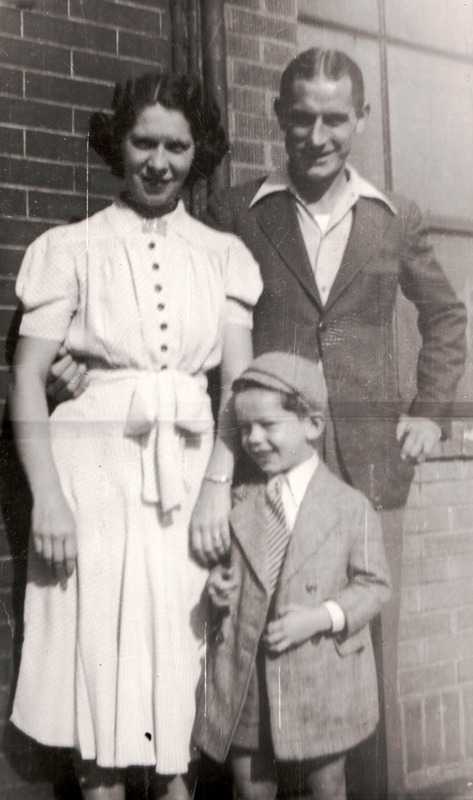 Elizabeth’s parents were in Poland – she had only immigrated the previous year – but her brother Emil served as a witness. It is assumed that Louis did not think his parents would approve of the marriage at his young age. Although Ancestry.com has marriage records from “Camden County, NJ, 1837-1910” it is likely that these are moreso county records than those from the city of Camden. Not only did I not find my great-grandparents’ marriage in this database, but it consists of only 6,000 records. Given the marriage boom in Camden after 1885, it is assumed that the city of Camden’s records are not included here. Historical Marker in Elkton indicating that the town was the "Marriage Capital of the East"
I do not have any direct ancestors who got married in Elkton, but I’m sure there are some collateral relatives who did. If you can’t find a marriage record, try Elkton. Records can be searched through the Clerk of the Circuit Court of Cecil County, Maryland. See their site for more information. It makes sense to travel across state lines to marry if Pennsylvania had “restrictive” laws regarding the marriageable age and a waiting period. However, there was another option – the couple simply didn’t tell the truth on their applicatoin. But, sometimes they did not want to lie about their ages in the city of Philadelphia. In my own family history, both sets of grandparents got married in Delaware County – despite the fact that it is in Pennsylvania and therefore governed by the same laws as the city of Philadelphia. Perhaps they were afraid that the city could “look it up” and discover their fib? All I know is that both towns are a bit out of the way for me today and I have a car and highways; my grandparents did not. In the Pater family, history repeated itself with another 17-year-old groom. My grandfather, Henry Pater, was two months shy of his 18th birthday when he traveled to Broomall, PA with his intended, Mae Zawodna. On the license application, Henry lists his birth year as 1907 instead of 1912, therefore making himself almost 23 years old. Mae, who actually was born in 1907 and was five years older than Henry, listed her birth year as 1908 – making herself appear to be 21 rather than 22 and a half. Neither family looked kindly upon the wedding, and in fact in the 1930 census a few months later they are each enumerated with their own parents – living a few doors away from each other. Eventually they told their families they were married, and in June of the same year their marriage was blessed in a Catholic church. My other grandparents traveled to Media, PA for their wedding in 1934. James Pointkouski accurately reported his age as 23, but Margaret Bergmeister makes herself one year older – reporting her age as 21. In reality, she would turn 21 a few months later. She also provides an address for her parents; however, both had been deceased for some time. They may have feared someone in Philadelphia confirming her birth record, which would have made her ineligible for marriage without the consent of her guardian. But they also did not want to wait an extra few months – their son would be born seven months later. Couples had many reasons to marry in seemingly unlikely places. If the law required parental consent, a waiting period, or even proof of either a divorce or death of a prior marriage, some couples traveled to avoid the hassle. Or they traveled to the next county to avoid the neighbors seeing the marriage notice published in the newspaper. This was by no means unique to the Philadelphia area – Elkton, MD received couples from up and down the East Coast, and other states have similar “Gretna Green” locations such as the Kentucky and Ohio River Valley border. If you have trouble finding Grampa’s marriage record – look around the neighboring counties or states! FamilySearchLabs has made Philadelphia Marriage Indexes available for 1885-1951. This is great news for those of us searching our roots in Philadelphia! It should be noted that these are the indexes only, not the actual marriage licenses. Also, you are not yet able to search the records with the name search since they have not completed the indexing, but you can browse the collection. If you are researching the years 1885-1938, you’re in luck – the record groupings that span those years are alphabetical (and typed, so they are easy to read). Simply to to the first letter of the surname you want to search and click on the number of images available and the records will appear on screen. Then, jump forward in the alphabet until you find the name you are looking for. What information will you see? Simply the last name and first name of either the bride or groom, the last name of the spouse in parentheses, the year, and the license number. You can then cross-reference the spouse’s name to get a first name for that person. While this may not seem like a lot of information, it did help me track down some maiden names and the year of marriage for quite a few couples. Of course, you can find out much more information by getting a copy of the actual marriage license, and now that you have the names, year, and license number it should not be too difficult. See the Philadelphia Marriage License Bureau for more information. For older marriages (pre-1915), you can obtain copies at the Philadelphia City Archives where the records are available on microfilm. Some of the older records are available at LDS Family History Centers as well. For the indexes from 1939-1951, the records are not strictly alphabetical, and they are printed instead of typed (printed very neatly, I might add). They are grouped by year, then by the first letter of the last name, then by the first letter of the first name. So, you’ll find all of the Pinto’s, Pater’s, Parker’s, Petruzzelli’s, and Portnoy’s jumbled together, but if you know the person’s first name, you can jump right to the section for that letter (so all of the Joseph’s, John’s, and Jacob’s with a last name beginning with “P” are together). Because of this, the indexes for these years will take more time to look through. But, the fact that they go all the way up to 1951 means that I should be able to find the marriage records for many cousins to help fill in some bare branches on the tree. My only “pet peeve” is that I can not seem to access one record group. For the years 1917-1938, the surnames beginning with X-Y-Z simply will not come up. I can’t access the records for Zawodny! I’ve sent a message via the “Feedback” form, so I’m sure the smart folks at Family Search Labs will fix the link soon. Update: As of 25 July 2008, this problem has been fixed on the site and the X-Y-Z records can now be accessed! One word of caution: if you can’t find a couple listed in the index, try elsewhere. All four of my grandparents were born and raised in Philadelphia, yet both couples got married – and therefore got their marriage licenses – in Media, PA (the county seat for Delaware County). My only great-grandparents to be married in the U.S. chose Camden, NJ – despite the fact they both lived in Philadelphia. Also, one of the most popular “marriage destinations” back then was Elkton, MD – apparently the legal age for marriage was younger here, so you didn’t need your parents’ permission as you would in PA! Did you know that actor Gene Kelly was married in Philadelphia? He and Betsy Blair (that’s her “stage name”) chose a spot “in the middle” for her New Jersey family and his Pittsburgh family. They were literally on their way to Hollywood where Gene would begin his career (bonus points if any readers know which film was his first…without snooping on the net). At least I finally found a way to combine my two GENE hobbies!